There are a lot of funny activities for Halloween but today I will tell you how to cut jack-o'-lanterns out of pumpkins. 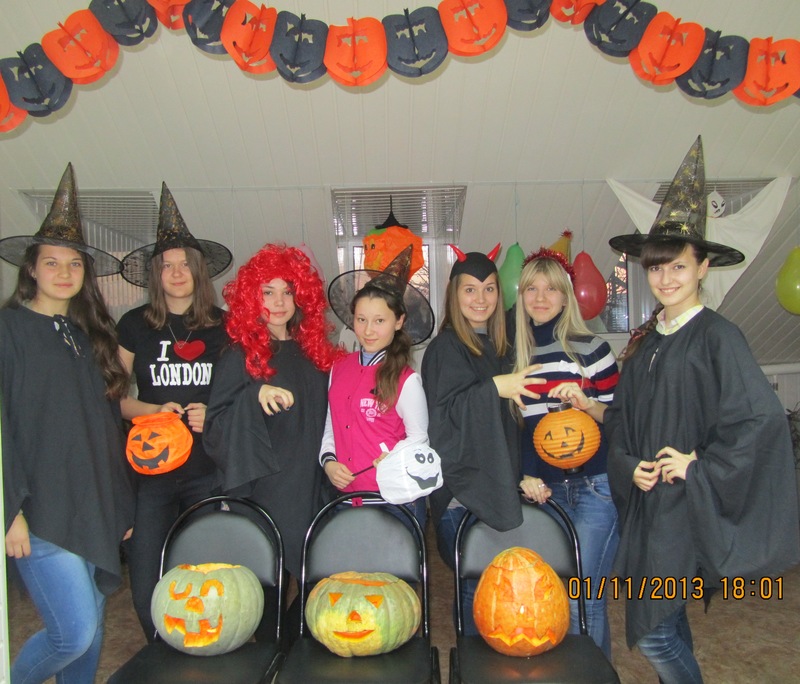 Every year my students and I organize pumpkin parties. 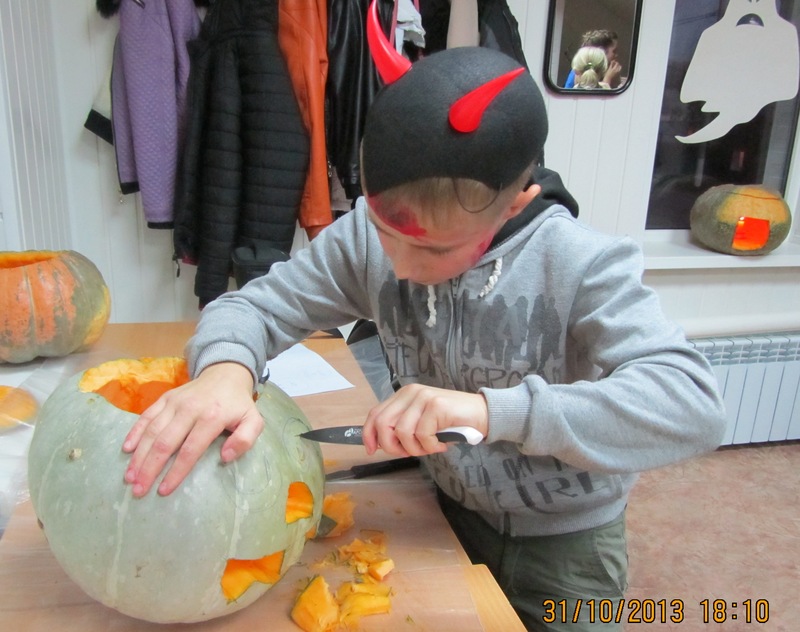 Each group of students carve their own jack-o'-lantern. The main condition is that all pumpkin lanterns must look different. A pumpkin lantern is a good way to keep the evil spirits, ghosts and witches from your door on Halloween. Jack-o’-lanterns, as people call them, can look spooky or funny, depending on the way you cut your pumpkin. So, ask an adult to help you as pumpkins are very hard to cut and follow this easy guide! Get a big pumpkin and cut a circle around the stem. Make the hole big enough to fit your hand in. Scrape out the pumpkin pulp and seeds. Draw on eyes, a nose and a mouth with a pen and cut them out. Triangles are easier than circles. Light a candle and burn a little wax to make a puddle inside the pumpkin. Hold a candle inside the puddle until the wax hardens. Ask an adult to help you light it. Put the lid on. There, a grinning face in the dark – no troubles from witches tonight! Each year millions of people carve Halloween pumpkins. The carved pumpkins are nicknamed “jack-o’-lanterns”. The custom of carving Halloween jack-o’-lanterns began long ago in Ireland and Scotland. But when the custom began, people in those lands did not have pumpkins. They are thought to have grown first in North America. The people in Ireland and Scotland carve jack-o’-lanterns out of turnips. An Irish story told how jack-o’-lanterns got their name. Long ago, the story began, a man named Jack met a devil on a road. Jack had been very selfish. He knew the devil would take his soul – unless he could fool him. As they passed an apple tree, Jack had an idea. He asked for an apple before going to hell. The devil climbed the tree to get the apple. As he did so, Jack carved a cross on the tree with his knife. The devil was scared to come down past the cross which is a symbol of Christianity’s good power. Jack helped the devil down, but only after he promised to leave Jack’s soul alone. Jack soon died. He could not enter heaven because he had been so bad. Needing a place to go, Jack tried to enter hell. But the devil kept his promise and would not let him in. The devil said that Jack must return to earth. When Jack cried that he could not find his way in the dark, the devil threw him a hot coal. Jack carved a turnip and placed the glowing coal inside it. Ever since, Jack has wandered the earth with his turnip lantern. Turnips with lighted candles inside them became known as “jack-o’-lanterns” after Jack. He has 3 crooked teeth but he won’t bite. He’s a jolly Jack-o’-lantern, as happy as can be! Once being in London in 1996, I stayed with a host family. I can’t say that Carmen Johnson, the mistress of the house where I lived, was much of a cook. It was real fun when I taught her to cook borshch. She didn’t use to spend more than half an hour a day in the kitchen. It was the middle of September and they got started ready for Halloween celebrations. She was going to invite a lot of children for the party and treat them to some tasty things. 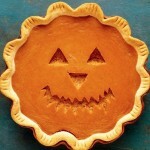 So, she decided to bake a pumpkin pie to delight all her guests! And guess what! She shared the recipe of the pumpkin pie with me. 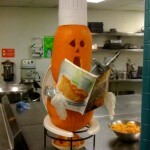 I think, you might want to cook something special for Halloween, too. — Cut shortenings or lard into flour and salt until particles are size of small peas. — Sprinkle in water, one tablespoon at a time, tossing with a fork until all flour is moistened and pastry almost cleans side of a bowl (1 or 2 tablespoons of water can be added if necessary). — Gather pastry into a ball. Flatten slightly on lightly floured surface. — Roll pastry 2 inches (about 5 cm) larger than a pie plate. Roll with floured rolling pin. — Place pastry on a pie plate. Trim overhanging edge of pastry so that the pie filling won’t spill out. If you need to bake the crust first before you put in filling, then bake it in a hot oven (240° C) for 8 to 10 minutes. — Heat the oven to 425° F (220° C). — Break three eggs in a medium bowl, add sugar and mix them with a spoon. 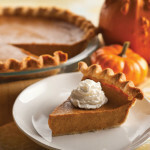 — Add remaining ingredients and pour the filling into a pie plate. — Bake for 15 minutes. Then turn oven temperature to 350° F (180° C) and bake about 45 – 55 minutes longer. Filling is done when a knife is inserted in the center and comes out clean. — When cooled, refrigerate at least 4 hours before serving. Than be inside a pie! And don't forget to share the recipe with your friends! Press the button! Sharing is caring! 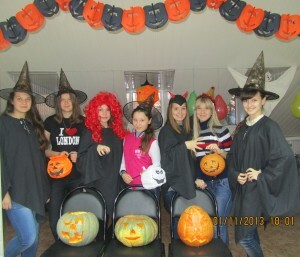 Эта запись написана автором Елена Шрамкова, 20.10.2015 в 13:11, и размещена в категории Halloween Time, Традиции и обычаи Великобритании. Следите за ответами на эту запись с помощью RSS 2.0. Вы можете написать комментарий или разместить обратную ссылку на своем сайте.